Looking for private in-home or in-studio Flute lessons? Our Queen Creek teachers are ready to get you started. Find your teacher today! Flute instruction that includes technique work on tone quality,agility,and musicality in a fun and supportive environment. Recitals twice per year. June Lessons available!! Only want a few lessons or to get a jump start on the next school year???? June is the perfect month with the option of performing at the end of the month even if you have only had a few lessons! The studio closes for the month of July and reopens in August. I grew up with music surrounding me. Both my parents play many instruments and they have passed that love on to me and my brothers. I started singing as a toddler and piano and flute came soon after. I love to teach, am patient and help my students to achieve their best. I create an environment for my students to feel safe expressing themselves, making mistakes,laughing and honing their musical language. cally. I've been told by students that they have learned more from me in 2 lessons then they have working with prior teachers for years. I earned my BM in Vocal Performance from the distinguished Eastman School of Music. I have earned the Bravo!Scholar and Howard Hanson award as well as first place in the Schubert Club vocal competition. I continue my studies with acclaimed Mezzo-soprano Gail Dubinbaum in Phoenix and I am a member of National Association of Teachers of Singing (NATS). I've sung all over the united states as well as in Germany and Italy. I performed the role of Frasquita in Phoenix Opera's production of Carmen as well as La Fata Azzurra in "La Bella Dormente nel Bosco" and as Sister Constance in "Dialogues des Carmelites" of which I was acclaimed by reviewers to have "revealed a luminous voice, and sang with ease and spontaneity." I have been a soloist with the St Paul Chamber Orchestra as well as with the Eastman Collegium. This past December I was a featured soloist with the Phoenix Symphony and returned to the Phoenix Opera to perform The Queen of the Night in The Magic Flute as well as worked with the Ohio Light Opera performing the lead roles of Hannah Glawari in "The Merry Widow" and Madame Pompadour in "Madame Pompadour." I'm equally comfortable with musical theater and have played leading roles in many productions including Marian in "The Music Man," Laurie in Oklahoma, Margy in "State Fair," Rapunzel in "Into the Woods," and Mrs. Gardiner in the premier production of "Pride and Prejudice." My students have advanced in the Classical Singer National Competition, Arizona Fiesta Chorus Competition, Hot Pipes Competition, and have been accepted to and attended summer programs at distinguished music schools including Westminster College and Eastman School of Music. They also perform with local theaters including Copperstar Theater, Moezart Productions, EVCT and more. Every vocal student will have different talents and struggles and will be at different levels so, I structure my lessons for the individual. However, with every student I focus on teaching correct breathing and healthy vocal use to enhance the natural beauty of the voice. Overall I have a laid back, humorous personality. I work to help the student achieve their goals whether its to be able to sing better in the shower or to become a professional musician. I offer 2 recitals per year to perform at and often form duets/trio's out of my students. I also offer studio classes for my singers who desire to have more performing experience with immediate encouraging feedback and for my more advanced singers I offer Master classes with guest artists to perform at and attend. Music room w/ piano, books, mirror, and seating for parents. Parents can observe if the student is comfortable with that but, I do not allow parents to comment on the student's singing of performance during the lesson. If they are a voice student they will need a piano, and they will need to purchase their own music and if possible purchase a recording device to record lessons and technique exercises. If they are a flute student, they will need to provide the music, and the instrument. If they are a piano student, obviously they would need a piano and would provide their own music based on my suggestion. I specialize in Opera, Operetta, Broadway, and jazz. I also teach pop, rock and country. On the piano and flute I teach classical and contemporary. I do not teach jazz piano or flute. I highly recommend Anna-Lisa to any vocal student. Our daughter thrived under her teaching and we are proud to say she received a vocal scholarship this year! Thank You Anna-Lisa!! Anna-Lisa is great! She works hard to keep my 11 year old son on task with just enough positive reinforcement and redirection. He really likes her and enjoys the one-on-one attention he gets. Very energetic and enthusiastic! Recommend! Dedicated and patient teacher with over 25 years experience playing the flute. The flute is my primary instrument. Experienced flute teacher of 10 years available for eager students from beginner to advanced ( and of all ages! Wither you are looking for short-term help or long-term goals, I can help. 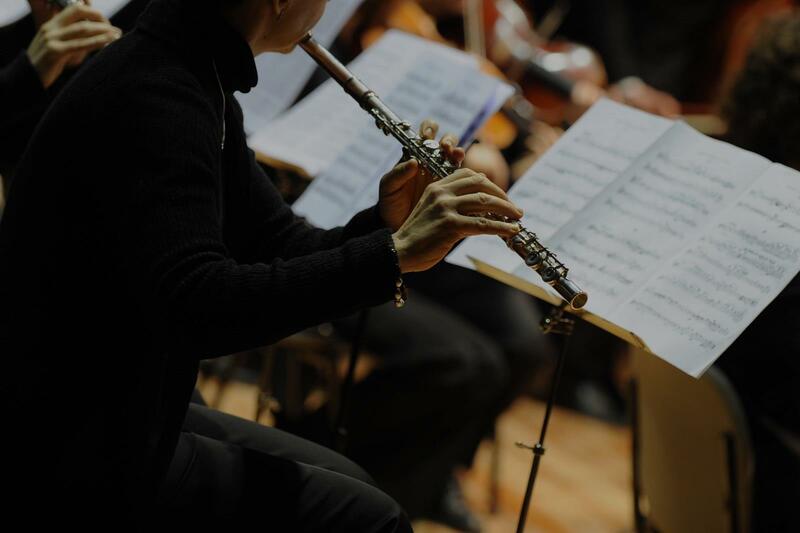 I structure my lessons so students learn what they want to learn, while also building a strong foundation of flute and musical skills; including, but not limited to: breathing, rhythm, tone, scales, notes. I typically use Standard of Excellence, Rubank Method, Suzuki method books, among other technique and studies books. I also have the following tools available to use during lessons: music stand and metronome. We can progress as quickly or as slow as you would like. Hello! I am so excited that you stopped by. I am an enthusiastic teacher that loves to encourage my students. I will develop a lesson plan to help meet your, or your child's, individual needs. We will learn the conversation, practice, and even games. I have lots of experience working with children and adults. I have been teaching for over ten years both English and the flute. I have taught both seventh and fourth grade- traditional and Montessori methods. I have experience teaching students with special needs and have different techniques to help students with their individual needs. At the end of each lesson, you will be provided with a detailed list of what we worked on and what should be worked on for our next lesson. I utilize google docs to help keep track of notes from our lessons. I hope to hear from you soon! She helped me a lot!! I teach flute lessons in the heart of Mount Vernon, just a few blocks away from the Peabody Conservatory in Baltimore, Maryland. With four years of teaching experience and a wealth of creative knowledge gained from my time at Oberlin College and Conservatory, my teaching caters to every age and ability. In addition to studying at Oberlin (and now Peabody) I grew up in a very musical household, and have two younger siblings. I love working with all types of students, whether they’re preparing for college auditions, just beginning the flute, or only looking to play for fun, and I also have experience with students with special needs. Please contact me through this website if you would like lessons, and I will respond within a day! I have a Bachelors Degree in Music Education and Flute Performance. I can teach students who are just beginning as well as students who are well into high school. I structure my lessons so students learn what they want to learn, while also building a strong fundamental skills. It's not just learning to play music- It's doing something you love. Whatever it is you want to learn to play, I can help you go there. Concert music, solos, video game music, disney, we can find a piece to teach the lesson that'll add some fun to the lesson. I'm a recent graduate of the University of Tennessee with a degree in Biochemistry and Molecular and Cellular Biology- quite the mouthful. I've been playing the flute for over a decade, and music is something I have a great passion for. It makes the world a little brighter and I'd like to share that with anyone who's interested. I've been tutoring in a variety of subjects for six years and my job is to make it as fun as possible, even when the lesson is boring. It isn't always possible if the person isn't interested in learning, but I'm always going to try. "Stephanie is an exceptional instructor! So grateful I found her!" Phoenix, AZ teacher: Stephanie H.
"Anthony is great. He is so patient with my daughter. I would recommend him." ity band and not feel embarrassed. He pays attention to details that others would miss. I recommend him without any reservations." "Great instructor, give lots of confidence to students"
ded in the most successful and time-honored traditions of flute technique. His early training in Venezuela was superb, and he went on to study with the great Tom Nyfenger, among others and has had a brilliant career as a soloist and flute pedagogue. As a person, he is most supportive, kind, and encouraging to all, at all levels. I have watched him teach on many occasions, and can safely say that one really can't find a better flute teacher! Highly recommended." Phoenix, AZ teacher: Marco G.
"Awesome. Had no idea this could be so great." Phoenix, AZ teacher: Adrienne K.
"Wonderful! Very knowledgeable and easy to learn from!" esson. I have really enjoyed taking lessons from her. She has also been willing to adjust to my schedule, when she could, when work won’t allow me to make it to my normal lesson. I also play Low Flutes and just bought my first Bass Flute. She also plays low flutes." "My niece loves her & is very excited about all she is learning"